How Many Words Is War and Peace? Leo Tolstoy’s historical novel on the Napoleonic invasion of Russia has become a byword for long books. If someone talks about doing something in the time it takes to read War and Peace, you can be sure that they mean it’s going to take quite a long time, and if your teacher comments that he or she wanted an essay from you, not War and Peace, your essay was way too long. War and Peace is considered Tolstoy’s masterwork and a significant contribution to literature, but I must admit that though I’ve tried a couple of times, I’ve never made it through the whole thing. The philosophical passages that make up much of the book are heavy going. If you have read this book, give yourself a medal and a pat on the back. You deserve it. How many words are there in War and Peace? War and Peace has 587,287 words, making it more than ten times longer than your NaNoWriMo novel. Tolstoy completed his first draft in 1863, but he later spent three years rewriting most of it. One would think after spending so much time on one book, Tolstoy would have been too exhausted to write anymore, but he went on to write Ana Karenina, which was published in 1877, as well as several other novels. Is War and Peace the longest novel ever? Remembering War and Peace was written as a four-volume set with two epilogs, it’s fair if we include some series. If we do that, we come across several famously lengthy stories. The Harry Potter series consists of more than one million words. The word count for the Wheel of Time series by Robert Jordan takes the record: 4,410,036 words! 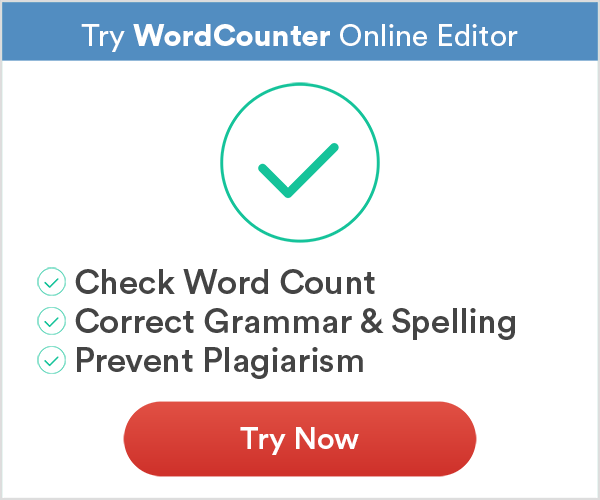 Just imagine writing more than four million words. Did you think that The Lord of the Rings would be near the top of the list? Think again! Tolkien managed to write his classic in “just” 481,103 words. If it’s one of your favorites, you now know something about it that you didn’t know before. 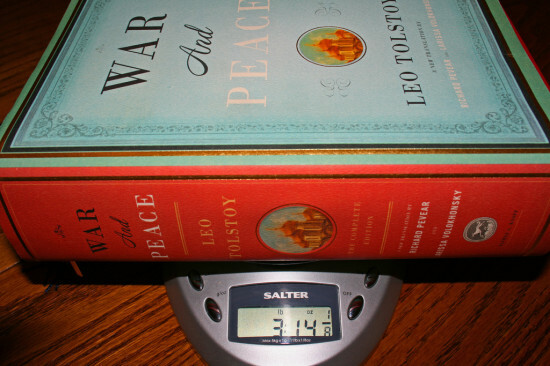 How Heavy Is War and Peace? The actual weight of the book depends on the edition and whether or not it’s paperback or hardback. As the above photo shows, the hardback version can weigh almost 4 pounds (3 lbs, 14 oz). Of course, paperbacks would weigh much less. 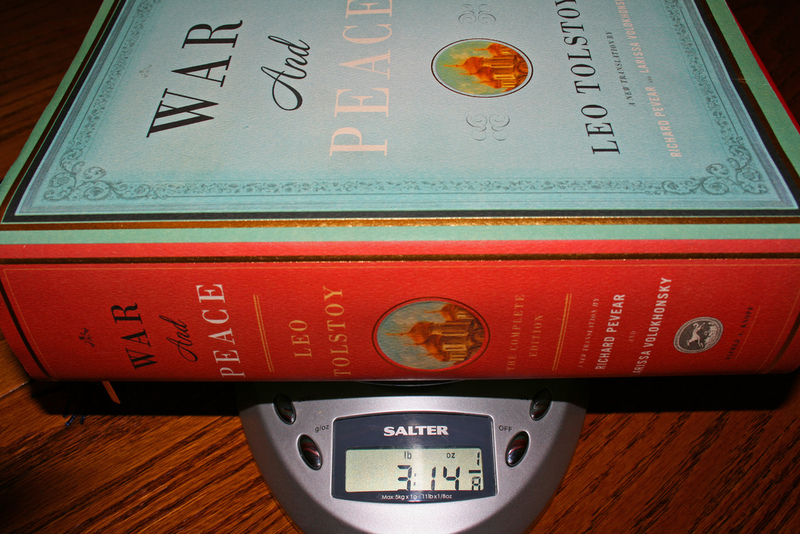 The 587,287 words in War and Peace end up being 1,215 pages. Again, the page number will vary from edition to edition due to different sized pages and print used. Tolstoy was, of course, a Russian author, so for us to be able to read his novel, it first had to be translated into English. This was done for the first time in 1885 by Clara Bell, who translated it from the French version. This re-translated translation was far from perfect, and ten further translations into English have been done since. War and Peace has been translated into German, French, Spanish, Dutch, Finnish, Swedish, Korean, Albanian and Czech. You must respect all these brave translators; what a massive job to tackle! Interestingly, a large portion of the book is written in French, but at the time, the nobility in Russia often spoke French as a matter of course, and some of them could barely speak Russian. Is War and Peace a novel? Tolstoy himself said his book was not really a novel in the truest sense of the word. Although he has woven fictional characters into the narrative, he carefully researched real-life events by interviewing people and reading first-hand accounts of the French invasion of Russia. Only the first half of War and Peace deals with fictional characters; the rest consists mostly of essays on war, power, and history. Tolstoy didn’t agree with the way military history is recorded and tried to get closer to the real events by portraying them through the eyes of real and fictional characters. The names of over 160 people who lived during that time are mentioned in his work. What makes Tolstoy so special as a writer? Apart from having written an extremely long book, Tolstoy was admired for his writing style. Just as movie cameras give us an overview of a scene, pan in, and pan out, so Tolstoy took readers from the “big picture” to the personal experiences of his characters and back again. This style of writing was relatively new, and Tolstoy is considered to be its master. In addition, he wanted people to be able to accurately visualize scenes, so he included a wealth of detail. In the last part of his book, where he increasingly looked at philosophies and facts, he managed to weave his essays into the story. Some abridged versions have taken these, and the second part of the epilog, which consisted solely of essays, out. Is it literary sacrilege to edit Tolstoy? Well, it’s a long book, and not all of it is really a “story.” Even when Tolstoy was still alive, abridged versions of his work were produced, presumably with his permission. Tolstoy was born Lev Nikolayevitch Tolstoy in 1828. He was born into the privileged aristocratic class and had the title of Count. In his younger days, he was a typical, dissolute aristocrat, but his first-hand experience of war, his travels, and his reading led him to a spiritual crisis and reawakening. He became a fervent Christian and a pacifist whose works inspired the likes of Gandhi. He died in 1910 at the ripe old age of 82. I know that this is a classic that everyone is supposed to read, but I could never get through the entire book. Believe me, I tried. It never held my interest. It’s not something I’m proud of, but I also don’t force myself to read books I don’t connect with. He was a very good writer. when we are reading book we don’t know how many words are on the book this tool is really good to know about how many characters and words count.